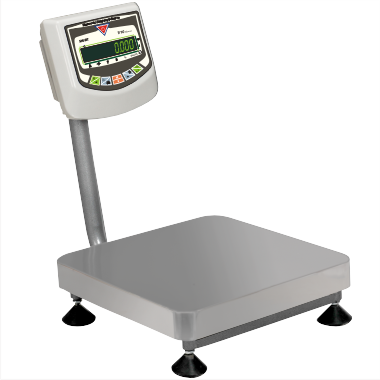 The bench scales are durable and portable and are designed with afforability and utility in mind. Ideal for general weighing and simple counting applications in production, packaging, warehouse, inventory, shipping and receiving areas with capacity range of 50 ~ 60kg and readability from 5g to 10g. AC or battery operated with remote display. The indicator, optionally mounted on a steel pillar has a large and easy to read LED display. Designed to perform routine weighing operations with speed and precision. Feature a simple, yet rugged, tubular-frame base design and indicators with tactile keys, bright LED display, built-in rechargeable battery operation and flexible mounting capabilities. Ideal for general weighing and simple counting applications in production, packaging, warehouse, inventory, shipping and receiving areas and related weighing applications.